Our (I say our because you and I are on a journey together through the gaming industry) next review takes us to an inexpensive puzzle game for the Nintendo 3DS, available on the eShop. I enjoyed the previous Tappingo, and it seems that the sequel, bar some game-breaking bug, is something I will enjoy, too. Let's see if that is the case with my review of Tappingo 2. It's Hip to Extend Squares. Earlier this year Tappingo came out with an attractive price, an admirable amount of puzzles, and a concept that walked a fine line between something completely new and something quite familiar. Now, Goodbye Galaxy Games is back with 100 more puzzles with Tappingo 2, continuing its flair for Picross-style puzzling. Much like the original, it is a definite must-buy for puzzle fans, and it even throws in some improvements to boot. Tappingo 2 plays on a grid that is sprinkled with multiple colored squares. When a square is tapped on, the player can draw a line from the square starting point. The line itself extends until it hits another solid square. The similarities to Picross are present due to each colored square having a number on them, dictating how far the line must go to satisfy the puzzle. The fun comes from determining the order of lines to be pulled and which directions they need to be extended. The end result of creating lines from squares and expanding them outward form a final object of some sort. This can be as simple as a food item, something game-related like a character or console, an animal, something environmental, etc. Like Tappingo, Tappingo 2 features a timer for each puzzle. This is purely for your own use to set personal best scores. There's no leaderboards to speak of, which while not mandatory for a game like this, would have added some longevity to Tappingo 2. Otherwise once you're done with the 100 or so puzzles, there's really no going back to the game save for redoing past puzzles. Really, if you've played the previous Tappingo game, consider its sequel an expansion pack with more puzzles to solve. Nonetheless, there have been some new tweaks to the formula to help Tappingo 2 have a slight edge over its predecessor. In the original Tappingo, larger puzzles meant smaller squares to deal with. Selecting the desired square required great precision since it was so tiny. In Tappingo 2, there is much welcomed zoom function for these bigger puzzles. Furthermore, a border surrounds each line, making discerning which line came out of which square easy to distinguish. This is especially helpful for similarly colored lines that sit next to one another. Regardless, a problem with the previous Tappingo still looms over its sequel. Since lines continue to extend until they hit another line or square, it can result in a chain reaction when a line is returned to the square it extended from. You get multiple lines that are no longer the necessary length and have to be shortened to fix your error. This can feel maddening at times when you have to shorten six, seven, eight lines because of an error on your part. The gist of this review is basically that if you've played the original Tappingo and enjoyed it all, you should definitely download this easily affordable sequel for more puzzles and the improvements the game has over its predecessor. 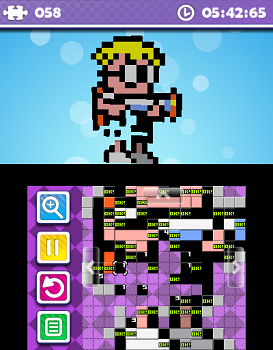 If you like games like Picross or have even a passing interest in that type of game, the idea of downloading both Tappingo games should linger in your mind. Unlike some of the larger, more involved puzzles in Tappingo 2, it's no challenge to wonder why you should look into this game. Can You Help Me Understand This About Gamergate?